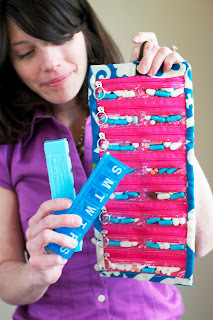 It's Lupus Awareness Month - let's celebrate with Pillbag savings! May is Lupus Awareness Month, and it's time to celebrate! Now through Memorial Day, take 12% off your purchase at Sara Gorman's Pillbags. Just type in "LUPUSMONTH" in the discount code during checkout and save! Why "12%"? To represent the 12 years since I've been diagnosed with systemic lupus. Here's to another dozen years of progress and productivity in the world of lupus...Pillbags, patents, new treatments, and all! Enjoy the savings, celebrate the month, and start carrying your medication in style! It really is crazy how fast a full year can go by. I feel like it wasn't that long ago when I was first learning about Lupus Awareness Month, its history, and what it really meant to show support for people living with this chronic autoimmune disease. For the last month, I have been working on a brand new infographic for Lupus Awareness Month 2013, and it is finally done! I hope to share this with as many people as possible in hopes of spreading a little awareness this month. This is a FABULOUS infographic! I'll be sure to send folks your way--it's so illustrative, and the pictures break down the stats so you can instantly see the facts and figures that we've all heard rattled off so many times before. thanks for sharing! Thank you for the 12% off! After accidentally taking one of my evening pills this morning, I decided I needed to order one of your gorgeous pill folds that I've been eyeing for awhile. I ordered the Trocadero one. Can't wait to get it! Laura--your pillfold is in the mail! i'm so glad you think it will help keep things straight. it certainly does for me! take care and thanks so much! Sara- I can't believe how fast my pillfold arrived!! I got it today and it is completely gorgeous!! Way nicer than the pictures look, even. Already got all my meds loaded in and chucked that ugly plastic thing! I won't mind at all pulling this out at work/ in a restaurant/ etc. to take my pills. Seriously, tell me where I can post a review and I will do it! Already telling everyone about my awesome pillfold. Thanks, again! I just wanted to say thanks to Stephen for taking the time to share this wonderful infographic! It is obvious that a lot of hours have gone into the creation of this work of art, and I believe that this is a great way to spread the word during Lupus Awareness Month. In particular, I had no idea that the 17th was Put on Purple Day, but I will certainly keep that in mind for next year. I was also very interested to see what the Lupus Research Institute was able to accomplish over the last year! I will certainly be looking to share your infographic with others this month. Oh and Sara, as always your blog is looking incredible as well! Thank you for posting this. Robert - Thanks for stopping by! All great information, you're right. Let's hope we can keep the awareness up, beyond L.A.M! Lupus quizzes galore - test your knowledge today! Lupus Research Institute - Making strides! May: A Month of Activities!